It's been awhile since I posted a review to my blog, and I'm going to try to catch up on my reviews over the next few Saturdays. I've been so busy with school and with MrsReaderPants that I hardly have time to breathe right now. I've been reading, but it's been markedly less since about November. 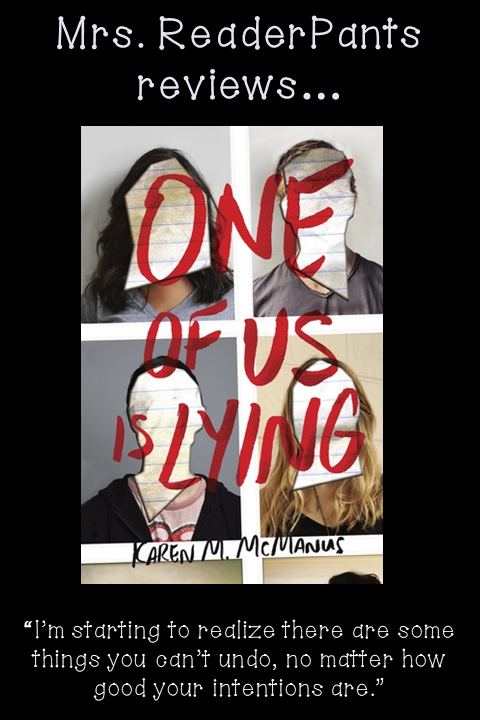 I'll kick off my review revivals with a book I just finished this morning: One of Us Is Lying by Karen McManus. I read this book because I just keep hearing about it! I told my 12-year old son about the book, and now he wants to read it, too. SUMMARY: Five teens--Nate, Bronwyn, Addy, Cooper, and Simon--go into after-school detention. Only four are alive a few hours later. The next day, police start questioning the four other students because it appears that Simon did not die by accident--he was murdered. Told in four alternating perspectives. REVIEW: Well, that was a lot of fun! I've seen many comparisons to The Breakfast Club, and I agree with those comparisons. We have Bronwyn (the smart, beautiful girl), Addy (the pretty, passive girl), Cooper (the All-American baseball player), Nate (the troubled drug dealer), and Simon (the writer and computer geek) all in detention for bringing their phones to class. When Simon gets up to get a drink of water, he collapses on the floor and ultimately dies. Police determine Simon was murdered and start questioning the other four students that were in detention with Simon that day. The story bounces among the perspectives of the other four students, all of whom have something to hide. All of whom have plenty of reason to want Simon out of the picture. But did they hate Simon enough to kill him? As you might expect, there are plenty of twists and surprises. I did manage to pick out the killer long before the big reveal, but I wasn't entirely sure until the whole plot unraveled out in the end. The big reveal was a little Scooby-Doo with the whole long confessional and somewhat cartoonish villain at the end, but I won't hold it against the book. One of Us Is Lying was loads of fun despite all that, and it's super-easy to booktalk with my students. We have two copies in our library, and both are constantly checked out and on-hold. THE BOTTOM LINE: Some readers may pick out the killer early on (the signs are all there), but I think many will scratch their heads right up to the very end. If you don't already have this book in your middle or high school library, what are you waiting for? STATUS IN MY LIBRARY: We have two copies that are constantly checked out. "One of Us is Lying" is one of the hottest books in my YA section right now. The author has another out that my kids are asking for, "Two Can Keep a Secret." Mine, too! We should receive the second one any day now, and I will have many happy readers. We had our MS Battle of the Books on Friday, and we always put up butcher paper for students to recommend books for next year's BB. Someone recommended Two Can Keep a Secret for next year.